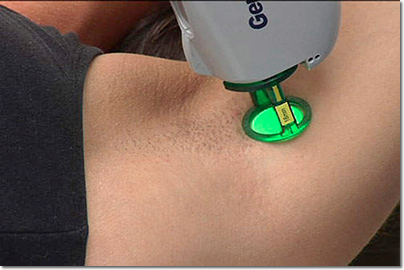 Lasers for hair removal target pigment (melanin) within the hair follicle. t is challenging to perform laser hair removal in patients with ethnic skin. This is because brown skin tones compete with the hair follicle pigment for the attention of the laser beam. It is imperative that laser hair removal in ethnic skin be performed by a qualified professional. Ethnic skin is much more prone to discoloration and permanent scarring. More importantly, without proper training, your laser technician may be too gentle — this may not only be ineffective, (requiring many extra treatments) but may actually stimulate MORE hair follicles. Hair has different cycles of growth. At one time, some hairs are in active growth, while some are resting. Lasers only treat actively growing hair. Therefore, several treatments are required (usually between 3-6) to capture the hairs in their active phase. Once laser hair removal has successfully been completed, I typically recommend a “touch up” session every one to two years to capture any stray re-growth. We will discuss the lasers that I recommend in ethnic skin by wavelength. Various companies make these wavelengths of lasers. It is key to discuss the wavelength your doctor is using. –755 nanometers (nm): These are also referred to as alexandrite lasers. Scientific evidence shows that 755 nm is the most effective wavelength laser for hair removal. However, this wavelength can only be used in light and medium brown skin tones. While some dark brown skin tones may be treated, it is best to ask your doctor to do a “test spot” and wait 2 weeks before treating the entire area. 755 nm lasers are usually associated with only minimal pain and typically do not require any numbing cream. Examples of companies/ names of 755 nm lasers include: Apogee, Coolglide, Elite, and Gentlelase. –810 nm: These are also referred to as diode lasers. 810 nm lasers are effective for slightly darker skin tones than 755 nm lasers. They are also slightly less effective. Examples of companies/names of diode lasers include: Soprano, LightSheer Duet, and Leda. –1064 nm: These are also referred to as Nd:Yag lasers. 1064 nm lasers have the best safety profile for darker skin tones. This is the only laser that I recommend for my dark skinned patients. Head to head comparison has shown that 1064 nm lasers are less effective than 755 or 810 lasers. However, if used properly, 1064 lasers have very minimal risk for discoloration, burns or scarring. Thus, it may take a few extra treatments with a 1064 laser, but is by far the safest. Examples of companies/names of Nd:Yag lasers include: Acclaim, ClearScan Yag, CoolGlide CV, GentleYag, Lyra, etc. –Intense Pulsed Light (IPL): IPL is not really a “laser” – instead it is a light source that can be selectively filtered. IPL is not as safe or effective in brown skin tones. I have personally seen numerous burns and permanent scars when IPL devices are used for hair removal in brown skin tones. In addition, scientific comparison shows that IPL is inferior to 1064, 810 and 755 nm lasers for hair removal. In fact, most studies show that the majority of hair grows back 1 year after IPL treatment. Why are IPL devices used then? The reason is that IPL is inexpensive for a provider to purchase (approximately $10,000), compared to a true laser which is very expensive for a physician to purchase (can be upwards of $75,000). Ethnic patients should be very careful if they opt for IPL for hair removal.